Last year, Bon Iver’s Justin Vernon and The National’s Aaron Dessner put on the Eaux Claires Music & Arts Festival, and this year they’re doing the same. 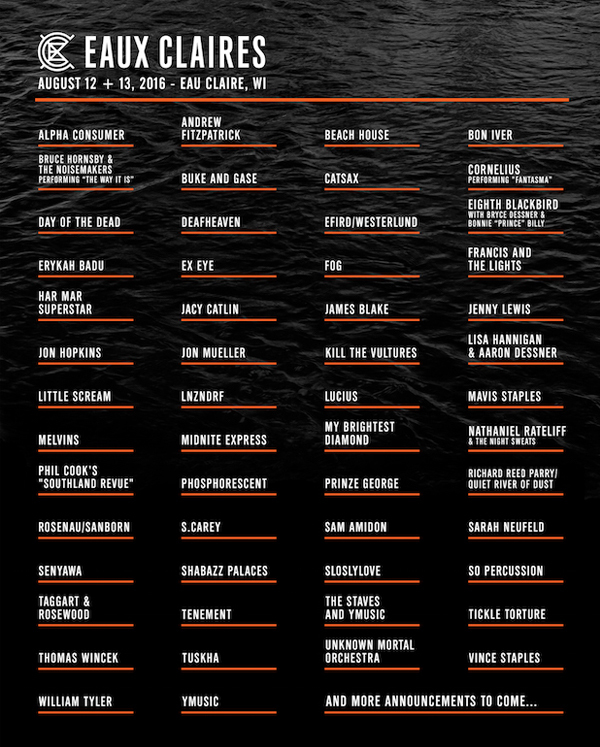 Ahead of the festival which will take place later this year on August 12 and 13 in Eau Claire, Wisconsin, the pair have announced the full lineup for the second year. The lineup looks pretty stacked, with everyone from James Blake to Beach House performing. Joining the previously announced artists are Shabazz Palaces, Jon Hopkins, Erykah Badu, Vince Staples, Unknown Mortal Orchestra, and many more. Also during the festival, there will be a big tribute to Grateful Dead titled Day of the Dead, in which an “all-star cast of musicians” will cover a number of Grateful Dead songs. A number of musicians performing at the festival will also perform an album of theirs in full. While it was initially rumoured that Justin Vernon and James Blake would perform live together at the festival, the poster and video announcing the lineup list the two as separate acts. However, there’s still a chance the two want to keep the forthcoming collaboration a surprise, so it wouldn’t be too shocking if the two did in fact collaborate again on stage. Check out the full lineup below, and get tickets when they go on sale tomorrow at 10AM EST here.